The Reese House is a Queen Anne style house located in North Carolina's southern region of the Appalachian mountains. Hendersonville, the county seat of Henderson County, is host to the well-crafted house. Located southwest of the central business district, the circa 1885 house occupies an almost square lot at the intersection of South Washington and Allen streets. The house is situated close to the corner, with narrow strips of grass separating the front (west) and south side elevations from the sidewalk. A short driveway leads off Allen Street to the back yard featuring mature hardwoods shading a grass lawn. The Reese House is a T-shaped, weatherboarded, two-story frame, Queen Anne style house with a small single-level rear ell. The asymmetrical main (west) elevation is dominated by a single projecting bay that is covered by an intersecting gabled roof. The C elevation is further distinguished by its ornate wraparound porch. Two internal brick chimneys flank hallways and reveal themselves from the interior portions of the structure. The elaborate Victorian porch is covered with a low hip roof that is supported by chamfered posts. Each post features a boxed base, neck molding, ornamental brackets, and a smaller scroll bracket or console. A saw-tooth pattern stretches between the chamfered posts. The balustrade connecting the chamfered posts displays turned balusters and molded handrails. Ornamental brackets also appear under the eaves of the second-story roof. The second level of the asymmetrical facade contains double-hung two-over-two sash windows set in simple molded wooden surrounds and sills. Sheltered by the porch's hip roof, the first-level windows are floor-to-ceiling, double-leaf casement with transom. Despite minor alterations, the exterior of the house has remained largely intact. After the death of William P. Reese, his son James undertook some alterations in the 1920s including the construction of a small shed addition to the rear ell to accommodate additional kitchen and pantry space. Other minor alterations include concrete block underpinning, storm windows, and gutters with downspouts. All of the exterior sawn detailing has remained intact, including circular gable vents, eaves brackets, and handsome cornice returns. The main block of the house is arranged in a center hall plan. On the first floor, pairs of rooms flanking the center hall are close in size and separated by interior chimneys accommodating a chimney in each of the four rooms. In the 1920s renovation a partition was removed between the center stair hall and the front parlor, but a clear separation between these spaces remains defined by the rising ceiling that follows the staircase. At the same time, a stairway was constructed at the rear of the center hall to access the basement, possibly replacing an exterior entrance. The rear ell and its accompanying shed addition are positioned on the north end of the rear (east) elevation and accommodate the kitchen, pantry, and bathroom. The second story contains two bedrooms positioned on the north end of the house, and a third bedroom south of the staircase and center hall with the only second-floor fireplace. Like the exterior of the house, the interior finish is largely intact. The walls and ceilings are still covered with their original plaster, including a simple rosette or patera on the parlor ceiling. The majority of the baseboards and picture molding survive throughout the house. Plain board surrounds at many of the doors and windows appear to be replacements. In many parts of the house, carpet has been placed over the wooden floors. On the first floor, handsome mantelpieces of simple wooden pilasters and shelves supported by decorative consoles front the four fireplaces in the three rooms of the main block and the east room of the ell. Each of these fireplaces displays distinctive characteristics including sawn friezes and ceramic tile. A plainer mantelpiece in the south bedroom of the second floor consists of wooden pilasters and a shelf. The open-string staircase, which rises on the north wall of the center hall, features a simple square newel post with a cylindrical knob, a molded handrail, turned balusters, and elaborate Queen Anne detailing on the exposed stringer. According to a copy of an unrecorded deed, in May of 1881 Turner Williams deeded Harriett Louisa Williams property, located on what is now South Washington Street, as her share of her father's estate. Family history relates that in the same year Harriet Louisa Williams married William P. Reese who had served as a drummer in the Civil War. A few years after the marriage, the couple's first child, James Reese, was expected. The news of the impending birth prompted William P. Reese to commission local builder James Brown to build a Queen Anne-style house for them on the property his wife had inherited, a tract along the waters of Mud Creek and located near Hendersonville's first school. James Reese grew up in the Hendersonville house, and after his father's death he continued to live there with his mother and wife. James Reese was a skilled plasterer and made his living contracting for jobs in Hendersonville. At his death in 1953, James Reese had resided in this one house for sixty-eight years. The house continues to be maintained by the descendants of Harriett Louisa and William P. Reese and is one of Hendersonville's few 19th-century houses remaining in the family of the original owners. 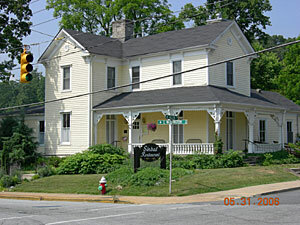 Today, this fine example of the Queen Anne style and Hendersonville's earliest residential construction is a restaurant.